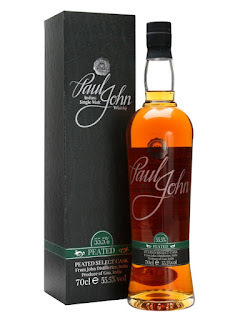 Some interesting Indian single malt today. 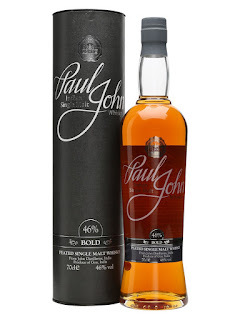 Paul John usually use Indian barley but for these they've imported peated barley from Scotland. These will be young but the climate in India is much hotter which matures the whisky more quickly. I was interested to try the Bold, since Horst Leuning liked it so much. Nose: 'Green,' chlorophyll, grass, sweet fruit, petrolic. No peat really. Taste: Soft, barley, gun smoke (cordite? ), sweet fruit, petrol. Finish: Medium length. Marzipan soaked in petrol. Notes: A bit weird but it works. Nose: Clean, barley. Not much here, let's try some water. Water: Green, burnt grass, petrol. Taste: Intense and clean with sweet barley. Water: Hot and petrolic, alcohol. Notes: I prefer the Bold. This is out of balance. Interesting to try. Not boring whisky at least!